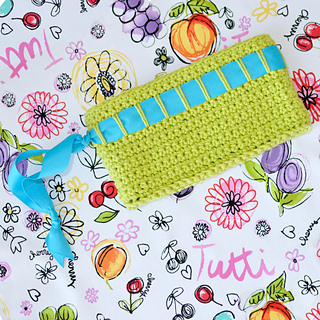 The Lucky Wristlet is crocheted in worsted-weight cotton, has a zippered fabric lining, and is carried around by the ribbon strap that’s threaded through strategically-placed spike stitches. 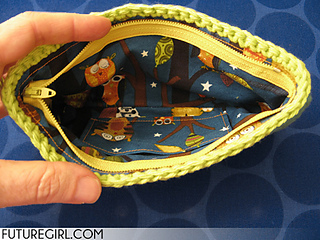 Make one according to the pattern or easily customize its size. 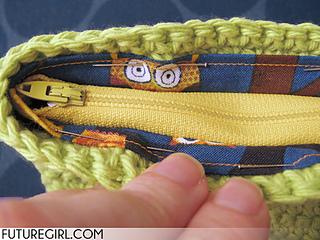 In addition to this crochet pattern, on futuregirl.com you will find step-by-step photo tutorials for crocheting the wristlet, sewing and installing the zippered lining, and adding a ribbon strap.